I'm not sure if anyone knows about this, but the Wii version of Tony Hawk's Proving Ground has a lot of leftover songs. 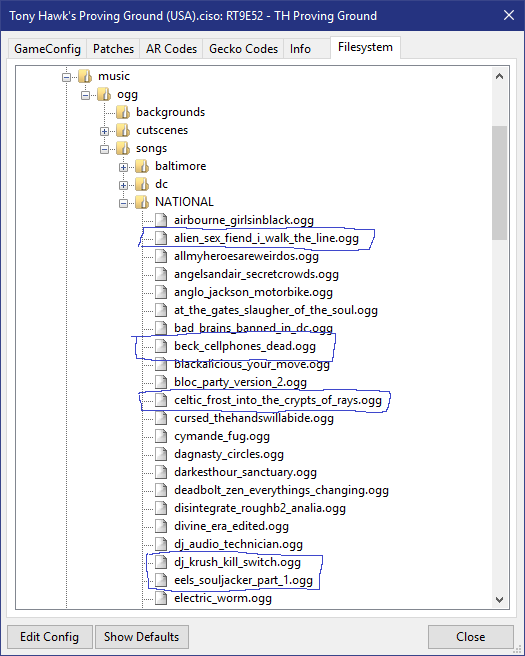 58 of them are actually used in-game, while 35 are left unused. And they both contain a song that isn't used. "Angel of Death" is probably a THP8 leftover, since it sounds almost identical to the THP8 version. All these songs (apart from Angel of Death) are also left unedited, meaning that the profanity wasn't censored. Thanks to hcs64 for the vid1_2ogg tool. Thanks ThAEm, cool to hear some new th music! Catarax wrote: Thanks ThAEm, cool to hear some new th music! You're welcome! To be honest, these songs would have fit pretty well in a TH game. There are actually a few songs here that appeared in other games, too. "Pretty Vacant" was in EA Skate, and "Gator Jaws" was in Skate 2, which came out 2 years after THPG. Some of my favorites from the list are "Cellphone's Dead", "Secret History", "Crooked", and "A Shogun Named Marcus". What I'm guessing is that Page 44 Studios (the guys who developed THPG for PS2 and Wii) might have either planned to do a different soundtrack for their port, or they were just testing things. I'm not sure, but it's cool, nonetheless.